Writings of Members and Friends of the NYAAP Community. All views and opinions expressed herein are those of the writer and do not necessarily reflect those of NYAAP. Jungian analyst and NYAAP President Gary Trosclair weaves together Jung’s ideas, contemporary trends, and both ancient and modern mythology to offer a perspective on our need to control. His essay was originally posted at www.thehealthycompulsive.com. Carl Jung famously wrote that the gods have become diseases. What he meant was that because we no longer consciously acknowledge the powerful forces we used to call gods and goddesses, they’ve gone underground and manifest in our physical and mental ailments. However fantastic they might seem, they are still forces to be reckoned with. Such is certainly the case with the Greek goddess Ananke. My point exactly. We don’t recognize her because she doesn’t fit in with the need to control. The ancient Greeks believed in the force of fate, inevitability and compulsion. 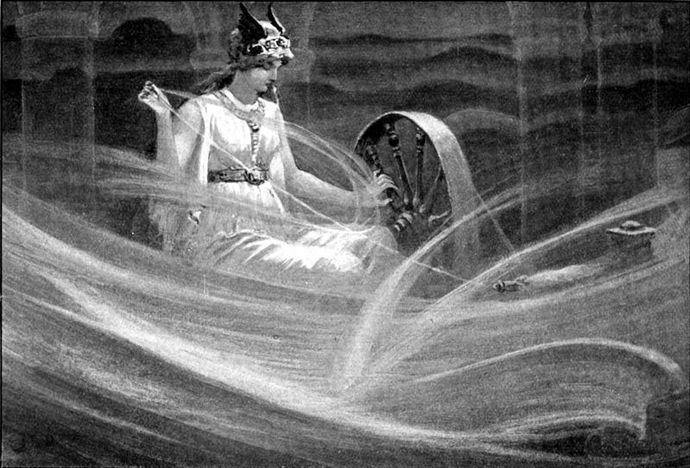 They personified this force as a goddess stronger than all other forces and called her Necessity, or Ananke. We can’t override her with personal control, no matter how hard we try. Ananke determines aspects of the world outside of us and inside of us. The outer issues are more obvious: death, illness, natural disasters, obligations, traffic, subway delays, clueless people, and recalcitrant children. When we try to resist these inevitable aspects of outer life, Ananke takes over our inner life too: our need to control the uncontrollable makes us compulsive in the worst sense, so much so that we actually develop an illness. We don’t much like Ananke these days. We modern folk like to believe that that we control everything. This is particularly true in American culture, and even more true of people who are unhealthily compulsive, those who are especially and infamously controlling. They like to think that if they work, plan, obsess, rush, harangue or tailgate enough they can make things happen in the outer world the way they should happen. Mixed results ensue, quite simply because we can’t control everything. Those who ignore Ananke, those who cannot accept that some things are out of their control and try to take control, end up losing control to control. They become compulsive in their efforts to deny her. They think they’re driving, but they are driven by Ananke. Without realizing it they try to become her. This is how the goddess becomes a disease. The medical term for this disease is obsessive-compulsive personality disorder (OCPD). OCPD is the most frequently occurring of the ten personality disorders listed in the American Psychiatric Association’s Diagnostic and Statistical Manual. There are many reasons why people develop OCPD, but I believe that the most common is that natural and healthy tendencies to be driven and hardworking are hijacked to avoid the feelings that would otherwise come with acknowledging limits. I can think of no better example of trying to shun Ananke than the characters from Star Wars young Anakin Skywalker and the sinister adult he becomes, Darth Vader. Star Wars is our contemporary mythology. It lays bare our culture’s attempts to control. If you didn’t see the prequels you might not know what’s behind all this. At 6 years old Anakin Skywalker is a very promising young boy, ambitious and talented to an extreme. He’s recruited to be a Jedi warrior, and has to leave his home and his mother. Later, after he’s been away training for some years, his mother is captured and tortured. He tries to rescue her but arrives just in time to see her die. Devastated that he couldn’t save her, he takes his skills to the dark side, eventually becoming Darth Vader–with the promise that he will be able to keep his wife from ever dying. He doesn’t mourn the loss of his mother and his limitations, but instead tries to take control over the world. He’ll stop at nothing to do so. He ends up indirectly bringing about the very thing he fears. His wife dies just after giving birth. Some say she died as the result of a broken heart from Anakin turning to the dark side. This transformation is not unusual for people who are born talented and Driven. Their skills are hijacked to try to cope with their fears of facing into disturbing feelings. Ananke rules more of our Fate than just death. She also determines the biological limitations of life, the needs that all humans have, including the need to eat, sleep, drink and procreate. It also includes personality traits specific to you, who you are naturally, your strengths and calling, which is partially the result of your genes. No matter how sincere your parents were when they told you that you could be anything you wanted to be, they were wrong. For instance, people who are naturally compulsive, driven, perfectionistic and conscientious will never become laid back. And that can be a good thing, if you recognize it and work with it. The Greeks personified forces such as Ananke so that they could recognize and come to terms with them. Naming something limits its power. Once you identify such a force, you know who or what you’re dealing with, and you can make the necessary accommodations. The standard response in their time was to burn incense, slaughter a lamb, or make some other sort of sacrifice to save their soul from an ignoble fate. These rituals might seem ridiculous to us today, but they fostered an attitude of acceptance that is psychologically adaptive. We have other options now. If we can acknowledge that we are not completely free, we actually become freer to deal with the limitations of both the outer world and the inner world in a more mindful and constructive way. You can’t defy death, even with the will and courage of a Jedi, but you can slow down enough to savor your life and your loved ones. You can’t force yourself or anyone else to do everything exactly the way you think it should be done, but you can do your best to live with integrity and meaning. And if you’re constitutionally Driven, you do need to work, produce, create and fix—but you don’t have to go crazy doing it. Recognizing Ananke can save you a lot of trouble: The next time you feel yourself compelled to try to achieve the impossible (be perfect, change other people, or control the future), recognize that there is much that’s out of your control and face the feelings that you’ve been trying to avoid by being so controlling. None of this is to say that we should roll over and give up or not stand up for ourselves or what we believe is right. We do have some control and can make the world a better place. But when we see our limits, we are better prepared to accomplish what is within our control. Psychoanalysis in the Post-Truth Era, by Alexandra Krithades, M.A., L.P.
NYAAP is a not-for-profit 501(c)(3) organization. Donations are welcome and are tax deductible.